Police has been deployed outside the Mumbai office of a foundation run by controversial Islamic preacher Zakir Naik, whose 'hate speech' is reported to have inspired one of the five Bangladeshi militants involved in the recent Dhaka carnage. 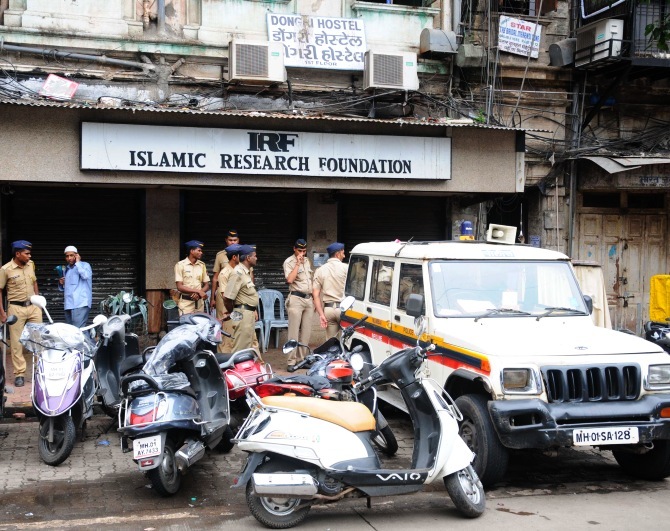 A senior Mumbai Police official said security personnel have been deployed outside Naik's 'Islamic Research Foundation' office at Dongri area in South Mumbai, as a precautionary measure in the wake of the recent developments. Decoding Zakir Naik: A TV preacher or a threat? "We have neither received any threat perception nor particular instructions from the state or Central government. We have deployed our forces only as a precautionary measure to avoid any untoward incident," the official told PTI. He, however, parried question on whether Mumbai Police has received any particular information or instruction to share some inputs on Naik. "There is nothing as such. This is something which is being handled at the state and Central government level. But as a law enforcing agency, we are keeping a close eye on the situation," the official said. Union Minister of State for Home Affairs Kiren Rijiju had on Wednesday told reporters in Delhi that, "Zakir Naik's speech is a matter of concern for us. Our agencies are working on this. But as a minister, I will not comment what action will be taken." Bangladeshi newspaper 'Daily Star' had reported that militant Rohan Imtiaz, son of an Awami League leader, ran a propaganda on Facebook last year quoting Naik. Naik, in his lecture aired on Peace TV, an international Islamic channel, had reportedly "urged all Muslims to be terrorists". The controversial Islamic orator and founder of Mumbai-based Islamic Research Foundation is banned in the UK and Canada for his 'hate speech' aimed at other religions. He is among 16 banned Islamic scholars in Malaysia. He is known in Bangladesh through his Peace TV, although his preachings often demean other religions and even other Muslim sects, the report said. Shiv Sena MP Arvind Sawant had on Wednesday said he had written to the Union Home Minister, demanding a ban on Naik and Islamic Research Foundation, in the country's interest. Last week, Islamist gunmen stormed a popular restaurant in Dhaka's diplomatic enclave and killed 22 people, most of them foreigners from Italy, Japan, India and the US in an attack claimed by the Islamic State. Claiming that the Wahabi ideology was becoming a breeding ground for terrorism, Security expert Alok Bansal has said that controversial 'tele-evangelist' Zakir Naik's narrative is similar to that of the Islamic State and the Al Qaeda. "We must understand that this is an ideological battle and it cannot be won by bombs or bullets; it has to be won by creating an alternative narrative and people like Zakir Naik have created narrative that actually helps organizations like the Al Qaeda or Islamic State to thrive because their narrative is very close to his narrative, though he keeps saying that he talks of peace but his narrative convinces people to go and follow Al Qaeda and the Islamic State." He stated that global community must ensure that his channel, Peace TV, must be banned to prevent him from accessing the influential minds of the youth. "Zakir Naik has been propounding an extremist worldview; his ideology and his channel propagate Wahabi ideology. This is dangerous because this is what actually drives terrorists. I think global community should take steps to prevent him from propagating his views and ensure that people like Zakir Naik don't have unbridled access to impressionable minds," he said. Wahabism is a religious part of Sunni Islam named after Muhammad ibn Abd al-Wahhab, an 18th century scholar, which has been described by many as a 'fundamentalist' ideology. Naik, a popular but controversial Islamic orator and founder of the Mumbai-based Islamic Research Foundation, is banned in UK and Canada for his hate speeches. He is also among 16 banned Islamic scholars in Malaysia.